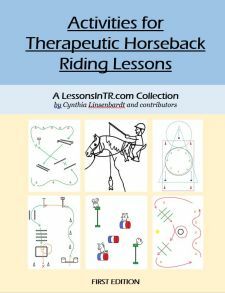 I am excited to share that the instructors at the Advanced Workshop I attended at Heartland Therapeutic Riding have agreed to let me post their lesson plans! This one is from Sandy Webster of Gaits of Change, our phenomenal workshop instructor, who made this lesson plan and then taught it to riders as an example of an Advanced level lesson. The riders will perform a release in 2 point at a walk 4x in each direction over ground poles with assistance as needed. Leap frog – all riders in 2 point in walk, Rider 1 says “leap frog” and the other two transition to trot and pass safely on the inside saying “inside” and then “good afternoon” as they pass, once past transition to walk. Continue until each has had a turn to say “leap frog”. 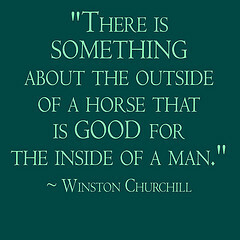 2 point is a balanced position with our seat off the horse’s back. The release is moving your hands from horse’s wither to 6-8 inches up the horse’s neck. When horses jump we are in two point to take the weight off their back. They also need to use their neck or balance so we release to allow them to stretch their neck. The release is done before the pole/jump and held over it. When the horse is on the other side, bring your hands back to the withers to the red ribbon (which means stop/finish the release). On each long side begin 2 point. 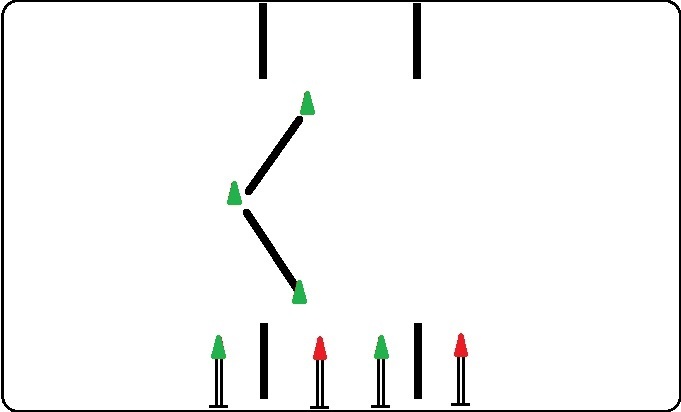 At each pole on the long side, as you come to the green cone move your hands from the neutral position (red ribbon) to the release position (matching green ribbon), after the pole when you reach the red cone put your hands back to the neutral position (the red ribbon). When the line is completed, gently come back to 3 point position (shoulder, hip, heel). Repeat down the next long side. Why do we need to do 2 point? Why is it necessary for a horse to jump? What else do we need to do to help our horses balance over a jump? Where do we put our hands for the release? How long do we release? Thank you so much for letting me share, Sandy! About Sandy (bio from her website Gaits Of Change): Having found success both as a winning equestrian competitor and as a leader and innovator in the therapeutic riding industry, Sandy Webster has a commanding style that inspires all. Her dedication to educational excellence is the foundation of Gaits of Change. Sandy Webster is a true competitor with a long history of wins and purses as a professional Jockey, Advanced Level 3-Day-Event rider, Dressage competitor and noted Carriage Driver. Additionally, for many years Sandy has been an outstanding innovator and practitioner in the therapeutic riding industry gaining much respect both within and beyond the industry. Sandy’s contributions span all fronts, yet her passion is teaching and education. Sandy’s workshops and speaking engagements are popular and successful. Sandy is an energetic, dynamic presenter who makes the material and work fun. Sandy’s passion for excellence is infectious and students often stay after hours to learn more! Her radiant personality, her belief in achievement and success, and her light but winning touch, motivates and inspires all. With a long list of experience, qualifications and certifications, Sandy has a wealth of knowledge to share.